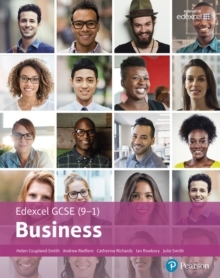 Exam Board: EdexcelLevel: GCSESubject: BusinessFirst teaching: September 2017First exams: June 2019 A comprehensive and accessible Student Book containing all the content you'll need to cover when studying the Edexcel GCSE (9-1) Business qualification. Explore the key themes of business; including how business opportunities are spotted and small businesses are set up and run, as well as how businesses grow and change and the crucial decisions that have to be made. Key features of the Student Book include: In-depth coverage of all the content of the course Engaging and contemporary case studies, from real businesses 'Exam-style questions' and 'Exam tips' throughout to give you plenty of practice at answering the kind of questions you might find in the exam A 'Checkpoint feature' that will help you to review your understanding as well as opportunities to further challenge yourself Activities that will help you to better understand content and key terms.